Bouguereau focused too much on feelings. On the one hand his paintings are "too perfect" and on the other they point out numerous small flaws in them. 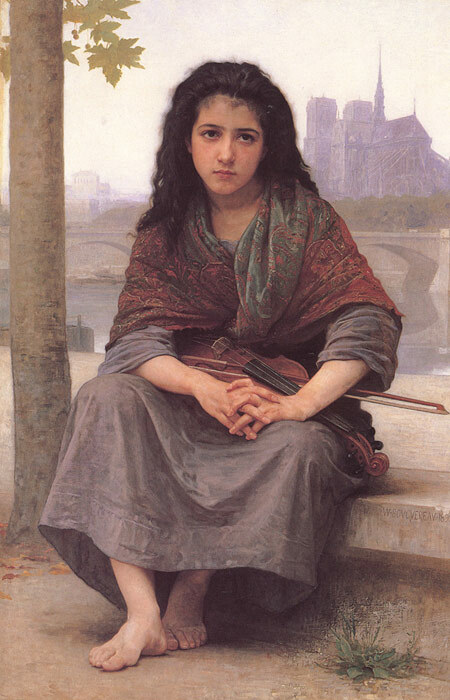 On the one hand, Bouguereau was too much of an individualist who didn't listen to what others said he should paint, and almost in the same Bouguereau bended too easily to the desires of his clients (most notably in Bohemienne [The Bohemian], where Bouguereau added a distant image of Notre Dame in the background after the painting failed to sell initially). There was some brief discussion over how Bouguereau had changed Bohemienne [The Bohemian], to include the cathedral of Notre Dame, so that it would sell better for his dealer. Some members of the audience pointed out that at a lot of times in history the artist was at the dictate of his patrons.This situation was different because of the times, and we found the idea that an artist would change a painting because of his dealer to be "weird". SPECIAL NOTE : The painter will make the reproduction as close to the original oil painting as possible. If you want your painting to alter from this likeness, please email us and " Bohemienne [The Bohemian], 1890 " will be reproduced according to your special requirements.